In the world of online advertising, Google and Facebook continue to dominate the market and have done a great job of monetizing their platform, improving the value for advertisers and publishers alike. As for Twitter, they've struggled to keep up with the pace and really maximise the monetization of their user base. As Google and Facebook continue to improve their self-service advertising platforms Twitter has been busy quietly. They've been trying to come up with an angle that both different and useful to businesses and marketers, to try and squeeze into the money advertising budgets brands make allowances for in online advertising. So how do they plan on doing this? Twitter is testing a premium subscription plan designed to boost the reach power users and small businesses get from their tweets, a bid by the struggling company to tap into a larger pool of advertisers. For Twitter users who were invited and pay $99 per month, Twitter will automatically promote your account's tweets onto people's timelines that don't follow your account. Twitter's advertising products already allow users and business to pay to promote their tweets to a broader audience. But the subscription is aimed at people who may not be experts in online marketing or Twitter ad campaigns and would prefer a service that does it automatically. This model is aimed at targeting a wider range of businesses and first-time Twitter advertisers to try and lure them into their ad platform. A low risk and low barrier to entry look like a solid plan, however, Twitter will need to provide valuable traffic, leads and conversions if they are to make the subscription package sustainable. The "private beta" program is aimed at small businesses and individuals - not big brands. Twitter confirmed that the subscription is currently being tested with a small set of accounts that had previously advertised on the social network. Some Twitter users, including anonymous personal accounts, received an invitation to try the service free for the first thirty days on Friday. 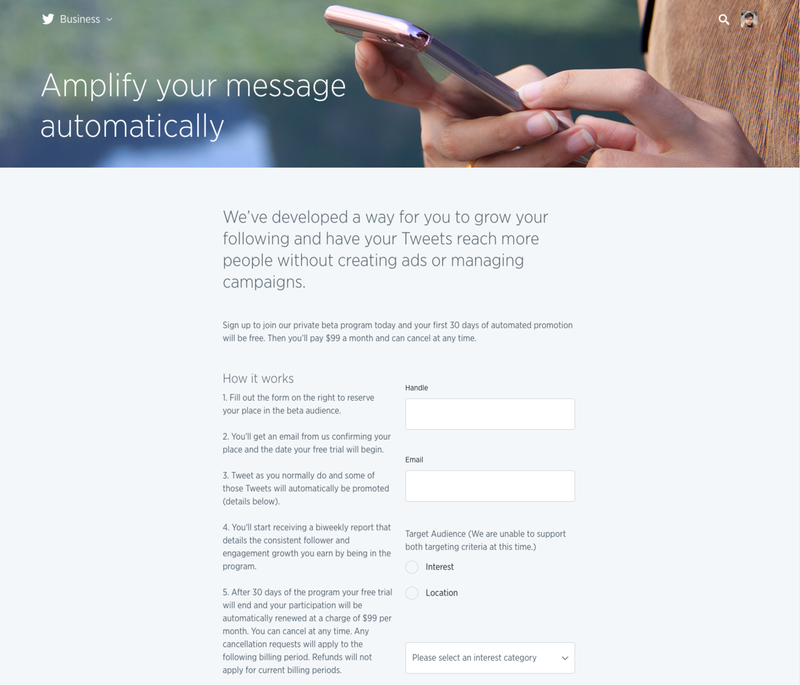 "We've developed a way for you to grow your following and have your Tweets reach more people without creating ads or managing campaigns," according to a page on Twitter's business site about the program. The way it works is that you tweet from your account as you normally do, and Twitter will programmatically select tweets to promote into other users' timelines - "the extent each Tweet is promoted may vary based on performance," according to an FAQ about the trial. "Retweets, Replies and Quoted Tweets will not be promoted, but, at this time, you cannot customize which original Tweets will be promoted," reads the FAQ. So users can't select individual tweets to promote in this trial. But they can target either a metro region, such as New York, or an interest, like "technology and computing." One big reason why Twitter users might subscribe to a service like this is to potentially gain additional followers. At the end of every week, Twitter will send subscribers a "report card" with "additional reach, followers, and engagements." This new offering comes as Twitter looks for ways to boost its advertising business after three consecutive quarters of declining ad revenue. Twitter announced that advertising revenue dropped 8% on an annual basis during its quarterly earnings report earlier this week so it makes sense that they're looking to reach a wider audience of smaller advertisers.